Many times, you have to attach something to Sintra®, or attach two pieces of Sintra® together, in a removable way. This means you'll be using fasteners of some kind. Normally you'll just drill holes and connect things with machine screws, nuts, and washers. There are a number of situations, though, in which you need to fasten something to a piece of Sintra®, but don't have a fastener long enough to accommodate the thickness of the Sintra® as well as a nut & washer. There are also situations in which you need to fasten something to an edge of a piece of Sintra. In such cases, it'd be ideal if you could just drill a hole in Sintra®, and thread it -- avoiding the need for a nut and washer. After a bit of poking around on the web, I found a variety of semi-conflicting advise -- some sites stating that wood and sheet metal screws (and even nails1!) worked well with Sintra®, others stating that putting threads in Sintra® was a futile effort. In the course of some experimenting, I discovered that Sintra® takes threads fairly well if you're careful. Well enough, at least, for small robots. I also discovered with a bit of tinkering that there are some simple things you can do to improve your odds. As is usual, all this experimenting involved a bit of semi-destructive testing (bwah... hah... hah...). To start with, I built 3 sets of thread test samples (for a 3mm machine screw) in some scraps of 6mm Sintra® sheet. I started with plain threads, then (since I'd been warned that the core of Sintra® sheets was "crumbly") also did two "enhanced" thread samples. In the first "enhancement," I coated the drilled hole with thin cyanoacrylate ("super glue") before tapping threads. In the second, I drilled a bigger hole, filled it with an epoxy plug, then drilled and tapped a hole in this plug in the normal way. Here we see a 10x view of "plain" 3mm threads in a piece of 6mm Sintra®. For those taking notes, this starts with a 2.5 mm pilot hole, followed by the 3mm tap. A 60x view of the plain thread sample. Note that the threads look pretty rough, with the thread pitch size (0.5 mm) getting closer to the Sintra® cell size. 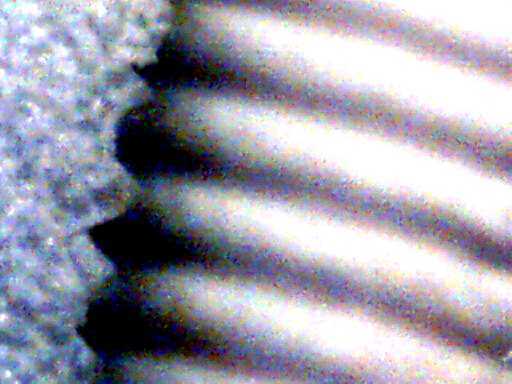 A 60x view of the edge of the cut threads. This gives you a feel for the Sintra® cell size, but also reinforces the fact that these aren't exactly the smoothest threads. 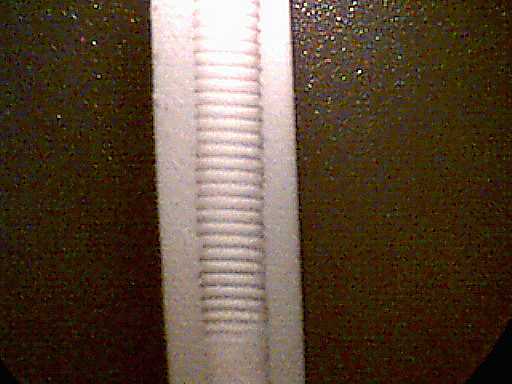 Here is a 10x view of cyanoacrylate "pre-treated" threads; again for a 3mm screw, this time drilled and tapped from a sheet edge. 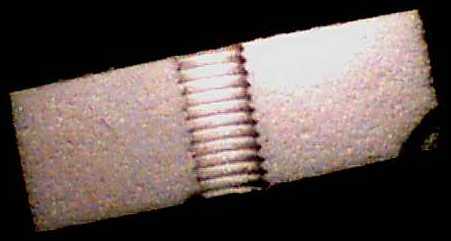 A 60x view of pre-treated threads and the edge of the cut threads. You can see that the cyanoacrylate pre-treatment yields cleaner looking threads; they may or may not hold up better over time as well (only time will tell). 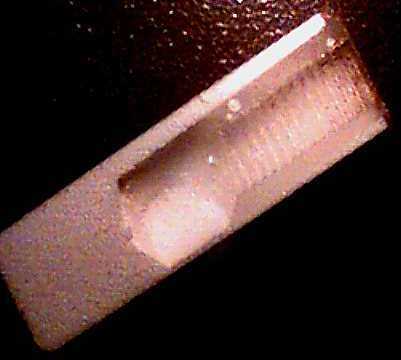 A 10x view of threads cut in a 4.5mm diameter epoxy "plug." I didn't bother to take a 60x view since even 10x is difficult to see well (a definite disadvantage of epoxy that dries clear). 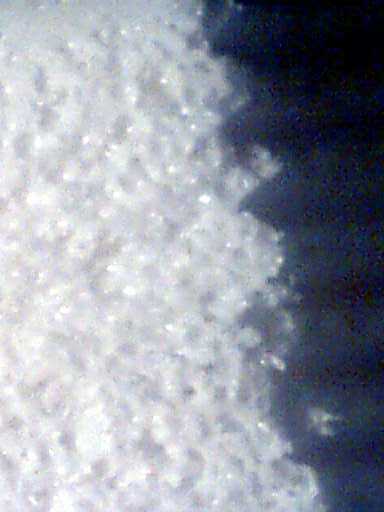 Still, you can see that the threads cut fairly cleanly. So with these thread samples in hand, I conducted screw pull tests with 3mm dia x 8mm screws. For all three sample types, I conducted pull tests of holes drilled both through the thickness of the sheet, and from the edge in through core material alone. Contrary to my expectations, I found that I could not pull a 3mm screw out of any of the three types of threads (not with just 25 lbs of force, anyway). I built new test samples with 2mm threaded holes and pull tested with 2mm dia x 8mm screws -- and had exactly the same results. This stuff was just too strong to pull loose, at least with long screws and my semi-primitive measurement gear. In search of a breaking point, I then made new samples of through-holes (of all 3 types) in 2mm Kömatex®, and tried again with 2mm dia screws. Finally I managed to push this stuff to its limit -- I've summarized my test results in a table (in each case, the load listed is an average from no less than 3 pulls per thread type). Note that I've got two sets of epoxy plug results; I also attempted to make plugs with "High Strength" epoxy without success (apparently some of the strength comes from the epoxy staying somewhat soft, too soft to thread). For most BEAM uses (low vibration, low likelihood of repeated fastener removal and reinsertion) with thicker Sintra®, even plain threads will likely work well enough. For joints which are assembled & disassembled repeatedly, my suspicion is that epoxy plug threads & pre-treated threads will hold up better than plain threads over time. Note that the material in the core of Sintra® is much softer than the face sheets. Cyanoacrylate pre-treatment seems to help the durability of cut threads, but buys you little improvement in raw pull strength. For joints facing heavy or vibrating loads, as well as joints in thin sheet, installing an epoxy plug (using quick setting epoxy) and drilling / threading it is definitely the way to go. Now that we're done with the rampant destruction, let's move on to applying finishes to our Sintra® creation. 1. In this write-up, I'm skipping the use of nails entirely. I've read that you can use them, but since crushing Sintra® does major damage to its strength, I can't recommend this fastening method -- you could wipe out your project with a single errant hammer hit. 2. For these tests, the plug diameter is 2.5 mm. In each case, failure was the result of the plug pulling free from the Sintra®, so you could likely use a bigger plug diameter without weakening things.